Who married whom? Who got fat? Who went bald? You used to have to wait for your high school reunion to catch up with classmates. Now a growing number of classes are using blogs to document their reunions and bring together far-flung classmates. How do you find out about class reunions? Kathleen McGuinness, South Pasadena, California, asked how people find out whether their class is having a reunion. Check with the school? We answered that unless things have changed recently, many schools have no idea what’s happening with reunions. Lists online may be better, although some classes may not list their reunions anywhere. All reunion listings depend upon organizers reporting them. 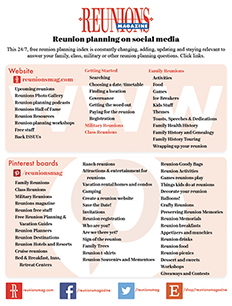 Reunionsmag.com features a list of upcoming class reunions and a class reunion archive to preserve contact information during years when there are no reunions. Classmates.com and reunions.com also list upcoming school reunions. One of the best ways to know about class reunions is to stay in touch with classmates. Wise reunion organizers ask for contact information for someone (often parents or siblings) who will always know where you are. In an article in the Pasadena Star News, Celebrations Section, McGuinness asked about class reunion numbers. 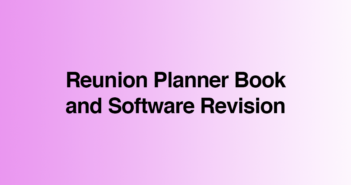 Carol Riley, owner of Reunions Unlimited, offered her guesstimate of average attendance at 20% to 25% for 10-year reunions, 30% or better for 20-year through 40-year reunions and 35% to 40% for 50-year reunions. “At the 20-year reunion, many are married, more settled and entrenched in their communities. By 30 years they’ve experienced life, divorce, death, lost jobs, changed careers and all kinds of disasters. They’re more grounded. Alumni of Bishop Kelly High School, Boise, Idaho, have established a web site featuring alumni activities, information about the annual golf tournament and 3 on 3 basketball hoop. The histories of these events are chronicled, as is the BKAA tradition of annual scholarships for incoming freshmen. The heart of the web site is the message board for “alumknights.” Some classes have used the message board extensively. Each class has a separate section including a list of “missing” classmates. Additional features are sections for each graduating class and hyperlinks to web pages featuring BK grads. There are links to famous alumni like actor William Petersen‚ ’72, Pulitzer-Prize winning cartoonist Mike Luckovich‚ ’78, and Jim Potter‚ ’91, who is playing professional basketball in Belgium and to those less than famous. Sherilyn Orr‚ Class of ’87, masterminded development of the site through her company Infofuel Productions in Boise.